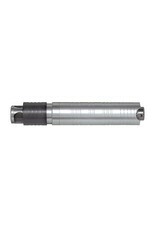 H.30H square drive handpiece has a geared 3-jaw #0 chuck with 0-5/32" (4mm) capacity. Includes chuck key in molded handle. Has positive locking mechanism (locking ring) for use with Series SRH, TXH, LXH and discontinued H motors and pre-lubricated, shielded ball bearings that do not require maintenance. 5-13/16" long, 1" dia. (center), ship wt. 10.55 oz. This handpiece is NOT interchangeable with Foredom's "Interchangeable" style handpieces.